This pattern came from my friend Jeanne. She used to have a knitting shop in Oskaloosa, and one of her customers brought it in to her. Not sure where exactly where it came from, but it sure is cute! And a great way to use up scraps. It is quick, easy to finish, and satisfying to knit. The apples are knit in garter stitch with short row shaping, and sewn up the side. 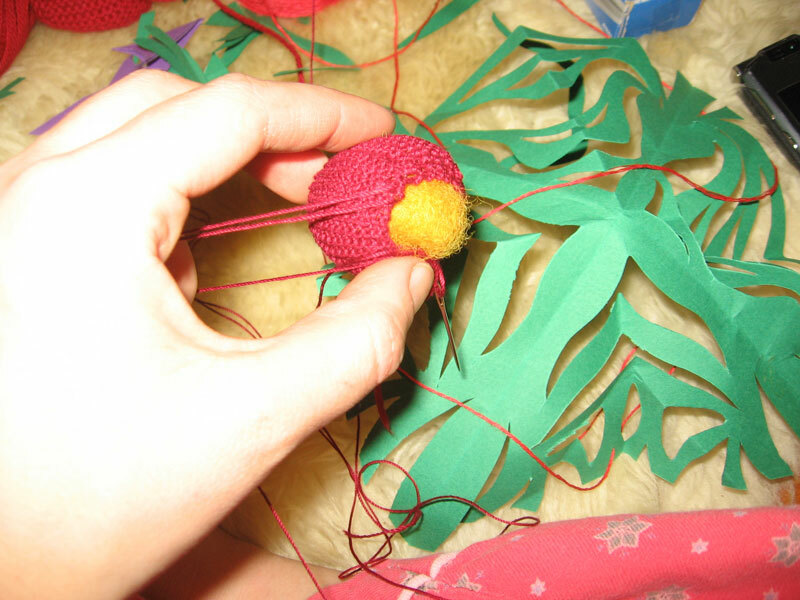 I stuffed mine with colored wool, and then gathered the strings from to and bottom to shape the apple. Jeanne gave me 4 apples (including the one pictured above) which are hanging on my “tree” along with some unfinished apples as I haven’t gotten to the leaves and stems yet. The stems are tiny little i-cords, and the leaves are little spots of garter stitch. 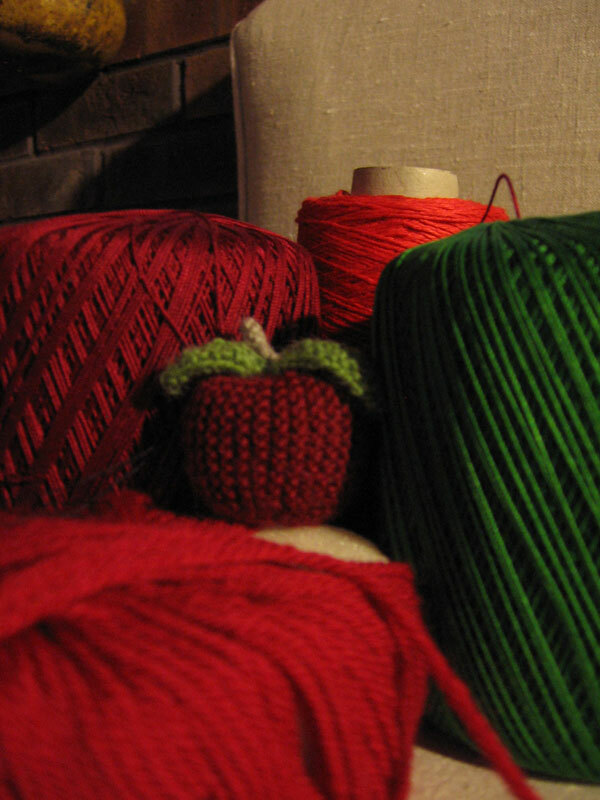 Yarn scraps in various shades of red, green, brown, or anything else that you might like an apple made out of. And some wool batting (you can also use polyester, but I find that stuffing with wool makes a much nicer feeling object. 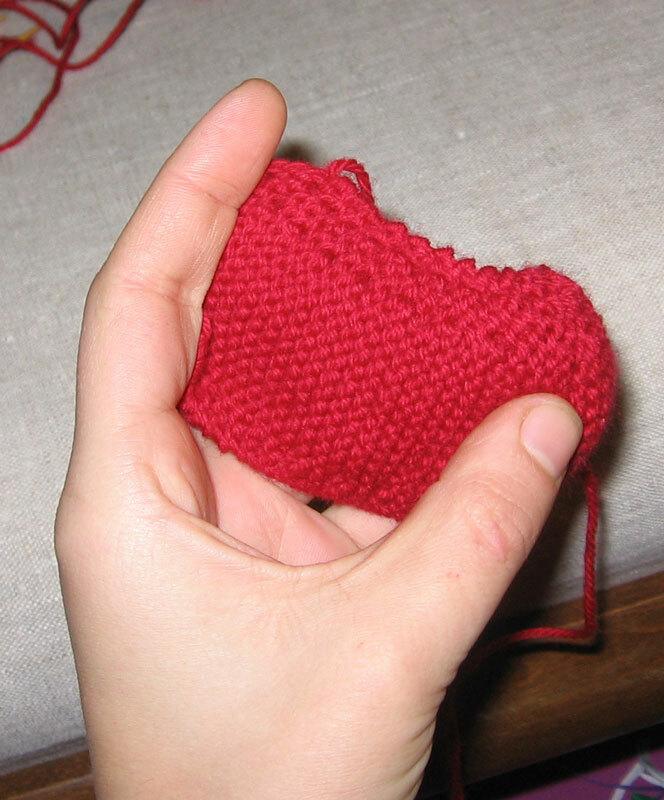 You will also need a sewing needle and some knitting needles that coordinate with the yarn (a tight gauge is good for this project). Making things by hand has to be one of the coolest things ever. I can only make food tho. My sister is the crochet monster. Happy xmas and good luck with your project. Is the pattern for the Christmas apple available? I actually lost my copy…but I will try and get another copy for you!